This page contains limited information about the 2019 Ale Trail. 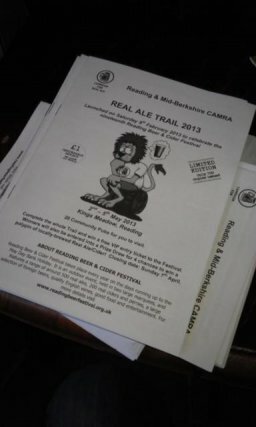 For the most up to date information, visit the Reading Ale Trail Facebook Group. Booklets are available for a £1 refundable deposit from the Fox & Hounds (Caversham), Nags Head, and Alehouse. There are only 700 booklets available in total. Books are available from the launch date - 9th February. Prizes this year include a t-shirt and festival beer vouchers, and entry into a prize draw to win a polypin of locally brewed real ale or cider. The closing date for completed booklets is Thursday 4th April, 2019. A. 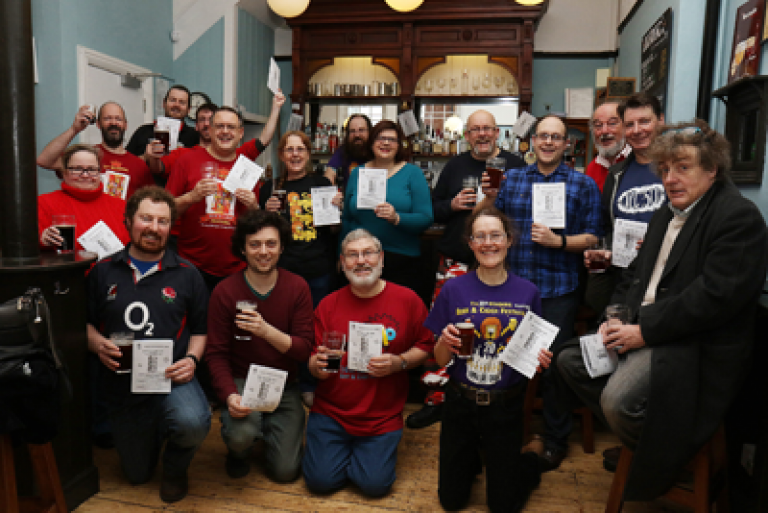 The Ale Trail is an annual event run by Reading & Mid Berks CAMRA in spring to encourage people to find some local pubs in the Reading area and publicize the forthcoming beer festival. This year 700 booklets have been printed featuring 24 pubs. The task is simple: get yourself a booklet, then for each half pint of real ale or real cider (or a soft drink for designated drivers) you ask for a sticker. Collect all 24 stickers and submit your booklet by the deadline for a prize. The 2019 Ale Trail booklets will be available to purchase from the launch day at the Allied Arms, and also at the Fox & Hounds (Caversham), Nags Head and the Alehouse in Reading. By completing the Trail (i.e. visiting all 24 pubs and getting the appropriate stickers), you win either a T-shirt AND a half-pint beer festival voucher OR six half-pint beer festival vouchers. By completing 16 pubs you get three half-pint beer festival vouchers. The booklet costs £1 which is refundable for those sending it in for a prize. You can also claim your £1 refundable deposit for this booklet. Q. How do you select pubs for the AT? These are split into two categories - those that are mandatory, and those that are simply guidelines. The selection shall consist of 24 pubs, all from within or adjacent to the Reading & Mid-Berks CAMRA branch area. The contenders for, or holders of the branch Pub of the Year (POTY) and branch Cider Pub of the Year (CPOTY) at the time the Trail is finalised, will be automatically included. Selection of a pub shall be mutually beneficial to CAMRA and the licensee. be able to administer the issue of stickers etc. in an effective manner (e.g. staff training; not losing the stickers; correctly issuing stickers to drivers purchasing soft drinks, but refusing them to those purchasing 'non-real' products such as keg, wine, spirits etc). if you wanted to do a crawl of all the local GBG pubs, you could simply buy the GBG! Pubs should be split more-or-less equally between town centre, suburban and rural. The selection should provide for a good geographical spread. Occasional 'clusters' may be provided in rural areas where several good pubs exist in close proximity, to allow participants making a long journey to score more than one hit. This makes the Trail more fun and, in encouraging more people out to the rural pubs, benefits all licensees in the cluster. At least 18 of the pubs should be accessible by public transport. We reserve the right to include two that are not thus served; such pubs often desperately need our support and publicity, and don't deserve to be excluded. By being 'forced' to make the effort. Trail participants are presented with a challenge - and in return they get to visit pubs they might otherwise not even have known to exist! There should be a 'churn' of at least one third of the pubs each year, so that there are always some new ones (or returning favourites) for people to try. This prevents the Trail from becoming stale. Any pub that has been in the Trail for several years in a row should be rested, a) as part of the 'churn', b) to give others a chance and c) and to avoid allegations of favouritism. Note, however, that the commitment to include the current PoTY overrides the need to 'rest' that pub for that year. There should be confidence that the average visitor will have a consistently good experience when visiting any pub on the Trail (service, cleanliness, ambience etc). Attempts shall be made to include 'rising stars', such as pubs with new licensees enthusiastic to promote real ale/cider; pubs whose new owners (or existing owners' purchasing policy) allows an expansion of the real ale/cider provision; pubs seen as possible future GBG contenders etc. Where feasible (e.g. where there is a decent provision of real products), the Trail may be used to highlight and support pubs currently under threat of closure. In this there is an obvious conflict with the rule on continuing to trade throughout the duration of the Trail; a degree of compromise may be necessary! Feedback from previous Trails shall be taken into account when preparing the new Trail. Q. Why do I have to pay to do the Trail? A. We are charging a £1 returnable deposit due to the limited number of booklets available this year (700). This hopefully means that only people committed to finishing the Ale Trail use the stocks and not people taking fistfuls for their friends etc. The £1 deposit can be reclaimed at the Membership and Information stand at the Beer Festival. Q. Where are the booklets? A. Booklets are only available at three pubs, the Fox & Hounds (Caversham) and the Nag's Head and Alehouse in Reading. Due to changes at the Festival end, we have only printed 700 booklets (as there are only 700 prizes!) and when they are gone, they're gone. They will cost a pound which can be refunded at the membership and information stand at the Reading Beer Festival. Q. Do the pubs pay to be on the Trail? A. No. The AT is free at the point of delivery to pubs. All pubs are selected on merit, using the criteria listed above. Q. Why isn't (insert well-known ale pub and GBG regular) on this year's Trail? A. There is a 'churn' of at least one third and up to one half of the pubs each year, so that there are always some new ones (or returning favourites) for people to try. Any pub that has been in the Trail for several years in a row will be rested, a) as part of the 'churn', b) to give others a chance and, c) and to avoid allegations of favouritism. The current branch Pub of the Year overrides the need to 'rest' that pub for that year. Of course, there's no reason not to visit old favourites during Trail time - in fact they would positively welcome your custom! Q. "Pub x' etc is amazing, why isn't it in the AT? A. Because they are not within our branch area. Our branch area goes as far north as the Oxfordshire border, as far south as the Hampshire border, as far west as Sulhamstead/Upper Basildon and as far east as Knowl Hill (see Reading & Mid Berks Pubs). Note that a change from 2016 onwards that we are including at least one guest pub outside our Branch area. A. The Ale Trail gets most of the trailers into at least one place they would never think of going into but are still good pubs in their own right. Remember that one person's gem is another person's idea of hell! Q. Why have you made the Trail harder to complete in recent years/why not print more than 700 booklets? A. Two reasons; a) cost - it costs us just under £1500 to bring you the AT, as well as many hours time spent by volunteers. b) the 'hit' on the beer festival budget - remember that for every AT beer token redeemed at the bar, that's often upwards of £3.50 the festival is losing through receipts; times that by 500-600 and you can see the figures for yourself! Q. I am the Designated Driver but the publican won't give me a sticker! A. You are right and they are wrong. The instructions to give 'Des' a sticker (if requested) for a soft drink is contained in the AT booklet (under Important Notes) and on the A4 instruction sheet we give out to each pub with the Ale Trail pack. If you have a smartphone, show them this page! A. We know. Real cider is an *option* available for Trailers - but not all pubs on the Ale Trail (Ale being the operative word) serve it. Whilst the rise in popularity of real cider and perry continues year-on-year, there are simply not enough pubs in our branch stocking real cider to be able to guarantee an Ale Trail that can be completed on cider only. If a pub doesn't serve real cider, then you cannot get a sticker for another cider instead. Why not let the pub know that you would like some real cider? This may encourage them to stock it in future. Within 30 miles of Reading there are real cider and perry producers who would love to get more business. Read more at Real Cider & Perry. A. That's because they are not 'real' ciders. A list of ciders classed as not 'real' can be found here: Cider not recognised as being real. If in doubt, refer to this list. Eg Stowford Press is made by Westons, but as it is sterile, pasteurised and carbonated it doesn't count as real. Old Rosie on the other hand - also made by Westons - does count as real. It's down to the production process, not the producer. Q. Uh oh! Some of the pubs have run out of stickers! A. Unlike booklets, we replenish pubs with extra stickers to meet demand. Each pub should start with 850 so no pubs should run out if the publican sticks to our instructions. If there are no stickers, ask the publican to sign or stamp the designated space in the booklet (some have attached business cards or till receipts!) and make sure to let us know about the shortage via the Facebook page. Q. Can I get a sticker even if I have forgotten/yet to obtain an AT booklet? A. Of course, so long as you buy a drink! We advise publicans to cut up a sheet or two of their stickers in advance for this situation. However you cannot just get the stickers stuck on any old bit of paper, the proper booklet is the only acceptable way. Q. Can I get a sticker for my absent friend in addition to my own? A. One qualifying drink, one sticker. So that's at least two halves for you, my friend! Q. Pub X was terrible and/or rude to Trailers! A. We try hard to make sure that pubs are briefed thoroughly about their role and we are disappointed if you have a poor experience. Sometimes it is because it is the first time/a long time since the pub has appeared in the Trail so teething troubles can be excused a bit - but Bad Attitude can't. Let us know via the Ale Trail Facebook page or by utilising the comments form on the booklet as we do read them and take action where necessary. And of course, if a pub is especially nice to you, let us know too! Q. What size are the ladies t-shirts? A. You need to collect the beer tokens at the festival itself. Q. Can I get my AT booklet back as a memento? A. Yes, you can pick it up at the Festival - make your way to the Membership and Information stand. Be aware it may take a while to find, so please be polite to the staff!